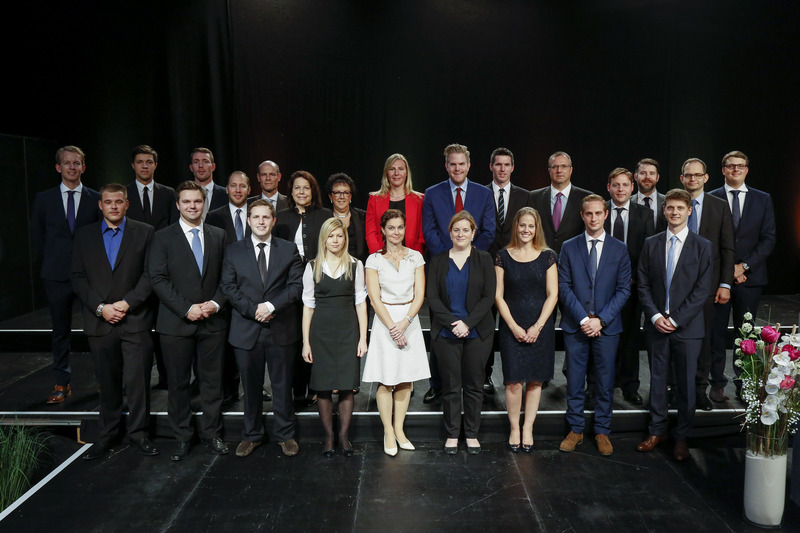 On the occasion of the University of Liechtenstein’s Graduation Ceremony 2016, which was held on Friday, 30 September, 150 graduates of the university received their diplomas. The keynote speech on this special occasion was given by Hereditary Prince Alois of Liechtenstein, who stressed the contribution the graduates would be making to the good of society. At the same time prizes were awarded for exceptional achievements. Facebook photo album "Diplomfeier September 2016"
A total of twelve graduates received prizes for outstanding performance from Liechtensteinian and Swiss companies and industrial associations. As in previous years, the Hilti company’s Foundation for the Encouragement of Young Talent in the Technical Professions awarded prizes for the most innovative diploma theses on the BA and MA courses in the faculty of Economics. On the Bachelor’s degree programme in Business Adminstration, prizes were given to Moritz Preg and Christian Schemeth, who both achieved a thesis mark of 6.0. The prize on the Master’s degree programme in IT & Business Process Management went to Hanspeter Hasler from Schaan, who likewise achieved a superlative thesis mark of 6.0. LBV, the Liechtenstein Bankers’ Association, awarded prizes for the best average in all modules of the Bachelor’s degree course in Business Administration and the Master’s degree course in Banking and Financial Management. These prizes were given to Claudio Lamprecht (BSc) with an average mark of 5.4, and to Christoph Lohrmann (MSc), who achieved an outstanding average mark of 5.9. LIA, the Liechtenstein Federation of Engineers and Architects, gave prizes to the best graduates on the Bachelor’s and Master’s degree programmes in Architecture. On the Bachelor’s degree course the prize went to Tatjana Viola Probst, who achieved an average mark of 5.3. On the Master’s degree programme the prizewinner was Teresa Rädler, with the same average mark of 5.3. The prize of Marxer & Partners Lawyers, for the best thesis on the Executive Master of Laws (LL.M.) in Corporate Law, was awarded this year for the second time, and went to Cornelia Rohrer-Drexel from Schaan. An I&F Family Wealth Preservation Award was conferred for the first time on the Executive Master of Laws (LL.M.) in Corporate Law. The Liechtenstein trust company Industrie- und Finanzkontor Ets. chose Angelika Layr and Ronny Velvart to receive prizes for their work in this field. Under the auspices of the wealth preservation approach which characterises the I&F Family Wealth Preservation Award, these students developed possible solutions for a practical case history with a view to the long-term strategic preservation of private assets, and sketched out the legal structures required. IMT Financial Advisors AG is awarding prizes for the first time to the three best graduates in the fields of Liechtensteinian and international tax law with reference to Liechtenstein, in conjunction with the Institute for Financial Services (FL House of Finance) of the University of Liechtenstein. The prizewinners are Dietmar Arzner, with a thesis mark of 6.0 and an overall mark of 5.8, Matthias Feurstein with a thesis mark of 6.0 and an overall mark of 5.5 and Carla Zimmermann with a thesis mark of 6.0 and an overall mark of 5.4.